Like many mailboxes around the country, mine seems to overflow on occasion with credit card offers. I’m not sure what it is, if their marketing departments all work on the same cyclical calendar, or if there are certain market indicators that trigger a flood of offers, but whatever it is, they all seem to come all at once. Normally, they all find their way to the shredder, to then find their way to the trash can. One of the things that we still do, because we haven’t paid off all of our credit card debt, is to occasionally transfer the balances to take advantage of those same credit card offers. One of those offers recently expired, and so I had been keeping my eye out for a new offer to make the move. That offer came in the form of those little convenience checks that the credit card companies are so fond of sharing. In this particular case, from a card that we’d already paid off, but had left open. It had two checks in it. One that offered 0% interest for about 13 months, and the other that offered 1.99% for about 18 months. 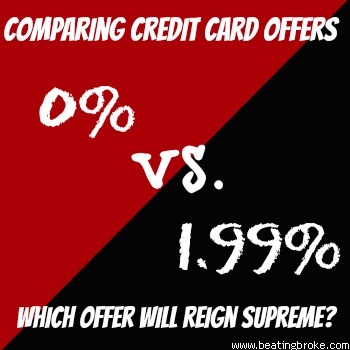 Which Credit Card Offer Will Reign Supreme? There was plenty of balance on the paid off card to take care of the entire balance of the other card. It was just a matter of writing the check to transfer the balance, and mail it. But, which one? Most people, including myself, if making the decision in a quick manner would likely choose the 0% offer and mail it off. However, it bears a little more analysis than that. Especially if, like in our case, you don’t think you’ll have the balance paid off at the end of the 13 months. When the transfer special expires, the rate bumps back up to the normal 12.24%. I put a little thought into it, and thought that there might be some advantage to using the 1.99% rate with the longer term. But, I had to be sure. I’m no math wiz, especially when it comes to interest rates, so I went looking for a calculator that might help me figure out for sure if there was an advantage to one rate or the other. I found two that gave me the numbers I was looking for. The first was a calculator from my friend Todd Tresidder over at FinancialMentor. It’s a simple Credit Card Comparison calculator. I think it’s meant to compare different credit cards, but I just punched in the numbers for the different offers on the same card and hit the button. What did it tell me? In both this calculation, and the second one, I used a few assumptions. These aren’t really true assumptions, but I had to use some baseline to determine the difference. I assumed that it would take us longer than 18 months to pay off the entire balance. I used an approximate payment. I also assumed (since the calculators didn’t allow for different payments) that we’d pay the same payment for the entire life of the credit card. Here’s what I found. In Todd’s calculator, the difference between the two offers was about 5 payments to payoff, and about $300 in savings. Which one won? The 1.99% offer. My initial thoughts were confirmed. An interesting note; I played with the payment amount, and the more we pay as a payment, the less difference there is. In fact, there’s a tipping point, where the 0% offer is better. As I suspected, the more you pay, the sooner you’ll pay off the balance, and the more advantage you get from using the 0% rate. But, remember that I made the assumption that we wouldn’t be paying it off in less than 18 months, so that isn’t an issue in our case. The second calculator that I used is this credit card balance transfer calculator. This calculator seemed to be set up a little more for this specific calculation. It adds in calculations for the balance transfer fee which is something that you certainly need to take into account if you are thinking of transferring a balance. With all the numbers punched in, and the calculator spinning up, my initial thought was once again confirmed. In fact, this calculator seemed to show even more advantage to going with the 1.99% rate. Here, I got an answer of about $405 in costs. Again, massaging the payment gave the same results in that the more you pay, the more advantage there might be in taking the 0% rate. We Have A Credit Card Offer Winner! So, all that calculated, we filled out the check for the 1.99% transfer and sent it off. But, it brought an interesting revelation to me. You’ve got to compare the offers. A difference of a few months, or a few interest rate points can make a much larger difference than you think. Compare them thoroughly, and try and make accurate assumptions about your payoff behavior so that calculators like the ones I used can give you accurate information. Have you ever found that an offer that, at first glance didn’t seem the best, really was? The introductory and balance transfer 0% interest rates on some credit cards can be a very enticing benefit. The fact that we see it offered so often proves that it works as a marketing ploy for the credit card companies. Some people take advantage of the offers and do what they call “0% rate arbitrage”. They take the CC company up on their offer and then pull the money out as cash and dump it into a interest bearing account where they can make several percent on the money. It’s like free money. But are the offers worth using if you’re like me and just want to be debt free and live a financially responsible life? The answer is not a straight yes or no answer. In fact, it isn’t really even a straight “maybe” answer. Much like most financial products, it is very dependent on your personal situation. Make no bones about it, I dislike credit cards. If I can, I will be credit card free some day and use only my debit cards. However, until that day happens, I’m stuck with them. I don’t use them, but merely pay them off. Until they are paid off, I’ve still got a few. While I have no intention of ever trying the arbitrage that some people try, I have and will use the 0% offers to help with my debt repayment. It’s a free loan. Sure, the rate is temporary, and the rate on expiration is likely just as bad as the card I transferred from. But, for that introductory period, I pay no interest, and every penny that I send as a payment goes towards paying off that balance. Essentially, I’m making 8%, 9%, and in some cases 20+% on my money. The offers can be a great tool while you are repaying your debt. Once you are done repaying your debt, however, credit cards have little to no use to you. The concept is that a credit card is a way for you to have a open line of credit whereby you can access your “credit” anytime you want from virtually anywhere. However, if you are a financially responsible person and maintain a debt free lifestyle, you’ll likely want to pay cash for nearly everything. Obviously, a debit card or good ol’ cold hard cash is your tool of choice. One exception that could be argued for is reward cards. These are cards that give you rewards based on the amount of money you spend using your card. If you are responsible and pay off your balance within your grace period, you can make a pretty good argument for the use of a reward card for the sake of the rewards. And some of the rewards can be quite tempting. Airline miles, gas discounts, gift cards, and even cars are among the lists of rewards. Some folks (like Ramit of I will teach you to be Rich) think that the reward cards are a horrible thing. The possibility of missing a payment or letting your spending get out of control is always there and one slip up can cost you well more than any reward you might get. And unnecessary risk is something you don’t want in your financial life. Back to the 0% cards though. The bottom line is that if you are already using some self control and not using your cards, transferring the balance to a 0% offer can save you quite a bit of money over those few months that the rate is that low. If you can’t manage the cards you have, though, forget it. The risk of causing more harm to yourself is too great to add more accounts to your portfolio. Also, don’t let a great introductory/transfer rate buffalo you into signing up for what would otherwise be a horrible card. Do your due diligence and read the fine print for annual fees, grace period, other fees, and most importantly the normal rate. I’ve seen several of these offers that are great, until the offer is over and then you’re hit with a 29.99% rate. Obviously, the extra savings of the low rate wouldn’t outweigh the normal rate if you’re transferring a balance from a card that only had a 8.9% rate! Be careful. Learn what you can and make as educated of a choice as you possibly can. I don’t condone using credit cards because I know first hand the damage they can do to a persons financial life, but I recognize that these offers can be a very valuable tool for the responsible few who have learned to handle their money properly.